EntroPay gives people all over the world the ability to create prepaid virtual Visa cards and it’s a great way to move money on and off your online casino account. There are lots of advantages to using EntroPay for your online gambling transactions. It’s anonymous, available to everyone, accepted everywhere that takes Visa and it’s really secure. There are no credit checks, interest charges or contracts and EntroPay allows you to make transactions in three different currencies: GBP, EUR and USD. After you sign up for a free EntroPay account and connect a form of payment – like your bank account or credit and debit cards, you can then create and load a virtual Visa card to for deposits and even withdrawals with most major online casinos. There are a number of reasons people prefer to use EntroPay instead of doing transactions directly between their bank account or credit card and an online casino. The benefits include enhanced security and privacy, more flexible transactions, potentially shorter wait times and lower fees. Keep reading to learn how to use EntroPay virtual Visa cards for online casino deposits and withdrawals, the service’s advantages and disadvantages, EntroPay’s average wait times and extra fees plus some background information on the company’s history and other business activities. EntroPay boasts lots of advantages unique to prepaid debit cards. Deposits are instantaneous, the service is affordable compared to some other banking methods and it’s really easy to get started using EntroPay by setting up a free account. It’s also really accessible for people who might not have credit cards or other options for doing online transactions. Extra Security – A lot of people prefer to have an extra layer of security between their sensitive banking info and the online casinos they play at. That’s exactly what EntroPay and other similar services offer. Since the online casino only interacts with your virtual EntroPay card, it keeps your personal information more protected and less likely to be compromised or used for fraudulent transactions. Instant Deposits and Fast Withdrawals – Similar to using credit cards to make deposits at online casinos, deposits via EntroPay are instantaneous. For a lot of people, being able to start playing immediately after making a deposit is a big priority and EntroPay definitely delivers on that. Withdrawals aren’t quite as fast but they’re usually processed and back on your EntroPay card in 1 to 2 business days. Accepted Everywhere – Since EntroPay is essentially a branded Visa card, it’s accepted basically everywhere that takes Visa. Most online casinos are happy to accept deposits via EntroPay and you can also use your card to make purchases at stores and vendors all over the internet. Privacy and Anonymity – Using a prepaid debit card like EntroPay improves privacy and anonymity in a couple different key ways. First, if you don’t want online gambling transactions showing up on your banking or credit card statements, EntroPay is a great option. The only transactions that will appear in your statements are the deposit to EntroPay to load your card. From there you can make any purchases you want without the same kind of paper trail. Secondly, it shields your personal information from the online casino as we discussed in the previous bullet point. Moderated Spending – Since you have to load your virtual card with funds before you’re able to make a deposit to your online casino account there’s a built-in moderating effect compared to depositing using a credit card. Some people like this because they’re way less likely to get carried away playing on credit or spending more than they originally planned. Getting started using EntroPay is really easy. Go to the EntroPay website and sign up for an account. It’s free and you can create your first virtual Visa card in under 60 seconds. 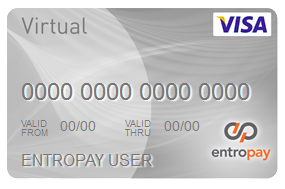 EntroPay cards are virtual which means you don’t need to wait for a physical card to be mailed to you. You can create up to 30 different cards in three different currencies (GBP, EUR or USD) or you can use the same card for lots of different transactions. After you’ve created your first card you have to load it with funds from another banking method like a bank transfer, credit or debit card or another EntroPay card. Once your new EntroPay card is loaded, you can use it the same way you’d use a credit card either over the phone or online. If you already have an online casino account, make sure the casino accepts EntroPay before going to the trouble of signing up, creating and funding a card. Chances are very good it will be accepted but it only takes a minute to make sure. Next, go to the casino’s cashier and click on the deposit option. Select EntroPay from the list of accepted deposit options. If you don’t see it right away there may be a button for “More Deposit Options” that will open up an expanded list of options. Once you’ve selected the EntroPay option, the cashier will prompt you for the card details and how much you want to deposit. If everything works properly the funds will appear in your account right away, ready to start betting with. Withdrawals work the same way, just in reverse. Online casinos always prefer for you to use the same method to withdraw money that you originally used to make your deposit. If you used EntroPay to fund your account, getting money off the site will go a lot more smoothly. Go to the cashier and find the withdrawal option. Choose EntroPay and enter the necessary details. Hit withdraw and in a couple days you’ll have the money back on your EntroPay card. Then you can use it to make other purchases, or move the money back to your bank account or credit card. The truth is, moving money online almost always comes with some kind of fees and charges. EntroPay is a good option, however, because it allows you to get around some of the fees and pay competitive prices for the things that do cost money. Starting an EntroPay account and creating a card is free. Putting money on your EntroPay card using a credit or debit card comes with a 4.95% fee but making purchases with your EntroPay card is free as well. Loading your EntroPay card directly from your bank account will cost 1.95% of the total amount transferred. If you top up your card using another EntroPay card it only costs £0.10 per transaction. If you have to convert currencies it will cost you 2.75% of the money you’re converting, and if you use EntroPay to withdraw money from your online casino account it will cost up to 1.95% depending on the online casino. Withdrawing money from your EntroPay card back to your bank account costs between £1.49 and £7.99 depending on your bank and where it’s located. If you’re withdrawing to a credit or debit card it comes with a £3.00 fee. If your card is inactive for six months or more there’s a £2.50 monthly dormancy fee. Wait times for transactions using EntroPay are short and it’s one of the service’s big selling points. Deposits are instant and withdrawals take only a couple days or less. EntroPay is a UK company that issues its virtual prepaid debit cards via the Anglo-Maltese Bank of Valetta, located in Malta. The company launched in 2003 and is credited with being the very first prepaid virtual Visa card in Europe. Since then it’s created more than 6 million virtual cards, had more than 2 million customers and processed more than £1.25 billion in purchases. In 2016 the company expanded to include a separate financial technology branch dedicated to B2B customers, called Ixaris Technologies. It completed an initial round of funding, raising $6 million from existing shareholders to accelerate company growth. EntroPay continues innovating new customer-facing financial technologies and remains a popular option for people not able or not wanting to use traditional credit cards. EntroPay is accepted at most major online casinos for both instant deposits and relatively fast withdrawals.